We’re so excited to start planning for summer 2019 with updates at McKinley Chalet Resort. Denali is loved by many, and we can’t wait to share the area with even more guests with a 99-room addition, including the first-ever junior suites at the resort. The three-story addition will showcase views of both Mount Denali and Mount Healy. Fifty-five junior suites will feature balconies, larger living areas and greater amenities for guests. Rustic-chic décor will be on display throughout the expansion and each floor will have a central, open-air lobby with cozy furniture. You’ll want to make sure to make your way to the third floor where a public deck space will allow you to take in the panoramic scenery. 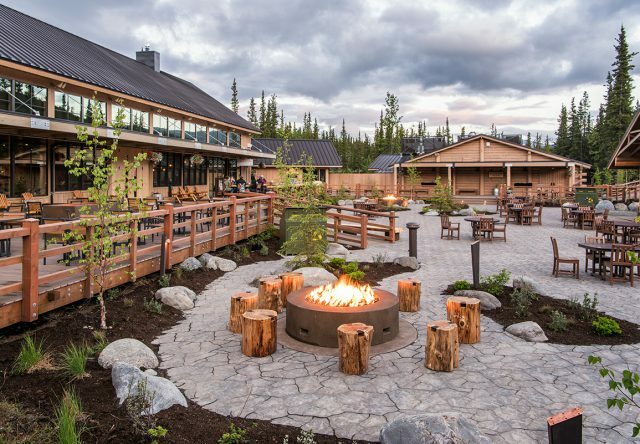 The heart of our 68-acre property is Denali Square. Walk the paths of the square to witness mountainous landscapes in a beautiful setting and enjoy all the features the square has to offer, including Karstens Public House with exquisite mountain views and outdoor seating on the deck with fire pits to keep you warm on those cool summer nights. The square also contains an amphitheater where a variety of local shows and ranger talks can be seen throughout the summer. The Gold Nugget Saloon is home to the lively Music of Denali Dinner Theater. The square is also home to a selection of shops offering local goods and an artist-in-residence cabin. With everything from dinner to shopping at your fingertips, you’re not going to want to leave the property – but you still should! Less than two miles from the park entrance, the resort is just a basecamp for the endless adventures Denali National Park has to offer.